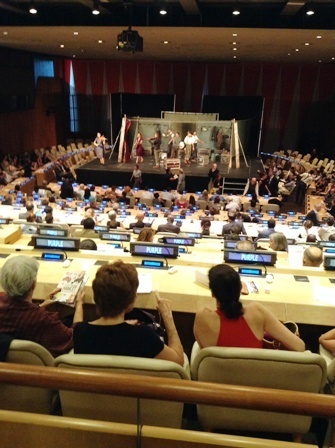 As far as Security Council presidencies go, British Ambassador Mark Lyall Grant began his stint with a splash - a live performance of the Globe Theatre's Hamlet to an enthusiastic crowd at the United Nations. To honor Shakespeare's 450th birthday, the Globe plans to visit every country in the world within two years --from Cuba to the Pacific Island of Nauru - minus those nations that are not safe or refuse to let them in. The crew will travel by plane, road, bus, train and whatever else is available. So far they have been to 28 countries and travelled 19,295 miles. To a standing ovation, some 500 UN diplomats, staff and journalists heard 12 actors perform an abridged version of the contemplative and impulsive Prince of Denmark. Hamlet was the bard's most popular play in his lifetime and one that is performed most frequently today. "It's a play that deals with the human condition, essentially, so that's shared with every nation in the world," Miranda Foster, who plays Hamlet's perplexing mother Gertrude, told a lively news conference. Said her stage husband, Rawiri Paratene, who plays Claudius, "At the heart of the play is a dysfunctional family and you could look at some parts of the world and see a dysfunctional family, where brothers and cousins are at each others' teeth." The backdrop was a dysfunctional world with conflicts in Syria, Iraq, Gaza, Ukraine, Sudan, Central African Republic, Mali and elsewhere, all on the agenda of the 15-member UN Security Council this month. The Council presidency rotates each month, according to the English alphabet, and the United Kingdom presides in August. The play, in which every member of the fictional Danish royal family is slain, coincidentally took place on the 100th anniversary of World War I, whose conclusion marked an historic abolition of kings and tsars. Monarchies ended in Russia and in the German, Austro-Hungary, Ottoman empires. The intended monarchies of Finland, Lithuania and Montenegro did not last long. "We like bold ideas. We like bold, simple - some would say stupid ideas, "said Dominic Dromgoole, the Shakespeare's Globe artistic director. Dromgoole said they would not refuse to play in any country that would let them in, whether North Korea or Syria. "Inclusivity is a better policy than exclusivity," he said. The exhausting role of Hamlet alternates between two actors: Nigerian-born Ladi Emeruwa, who trained at the Royal Academy of Dramatic Art and Naeem Hayat, who studied at the London Academy of Music and Dramatic Art and who was on stage at the United Nations. He was born in London to Pakistani parents. Unfortunately acoustics in the nose bleed section of the UN Economic and Social Council hall were less than desired. Paratene, who plays Claudius, Polonius and/or the Ghost, said it would be foolish for the cast to believe "we could get diplomats to operate better." "We're here to tell a story."